From 1535 onward, the colonial era proceeded with the usual intrigues among the Spanish conquistadors, but with no major uprisings by the Ecuadorian Indians. 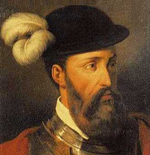 Francisco Pizarro made his brother Gonzalo the governor of Quito in 1540. Hoping to conquer the Amazon and find more gold, Gonzalo sent his lieutenant Francisco de Orellana away from Quito to prospect in 1541. The lieutenant and his force ended up floating all the way to the Atlantic, becoming the first party known to descend the Amazon and thus cross the continent. This feat took almost a year and is still commemorated in Ecuador today. Lima, in Peru, was the seat of the political administration of Ecuador during the first centuries of colonial rule. Ecuador was originally known as a gobernacion (province), but in 1563, it became known as the Audiencia de Quito, a more important political division. In 1739, the Audiencia de Quito was transferred from the viceroyalty of Peru, of which it was a part, to the viceroyalty of Colombia (then known as Nueva Grenada). Ecuador remained a peaceful colony during these centuries, and agriculture and the arts flourished, Various new agricultural products were introduced from Europe, including cattie and bananas, which still remain important in Ecuador today. There was the prolific construction of churches and monasteries, which were decorated with unique carvings and paintings, the result of a blend of Spanish and Indian art influences. This so-called 'Quito School of Art,' still ad-mired by visitors today, has left an indelible stamp on the colonial buildings of the time. Life was comfortable for the ruling colonialists, but the Indians (and later, the mestizos, or people of mixed Spanish and Indian descent) were treated abysmally under their rule. A system of forced labor was not only tolerated but encouraged, and it is no surprise that by the 18th century there were several uprisings of the Indians against the Spanish ruling classes. Both poor and rich died in violent fighting. One of the best-remembered heroes of the early revolutionary period is Eugenio Espejo, born in Quito in 1747 to an Indian father and a mulatto mother. Espejo was a brilliant man who obtained his doctorate by the age of 20 and became a major literary voice for independence. He wrote political satire, founded a liberal newspaper and spoke out strongly against colonialism. He was imprisoned several times and died in jail in 1795. The first serious attempt to liberate Ecuador from Spanish rule was by a partisan group led by Juan Pio Montúfar on August 10, 1809. The group managed to take Quito and install a government, which lasted only 24 days before royalist troops (loyal to Spain) were able to regain control. Independence was finally achieved by Simón Bolívar, the Venezuelan liberator who marched southward from Caracas, freed Colombia in 1819 and supported the people of Guayaquil when they claimed independence on October 9, 1820. It took almost two years before Ecuador was entirely liberated from Spanish rule. The decisive battle was fought on May 24, 1822, when one of Bolívar's finest officers, Field Marshal Sucre, defeated the royalists at the Battle of Pichincha and took Quito.